Click here to watch Gene Kelly Tap Dancing on Roller Skates. 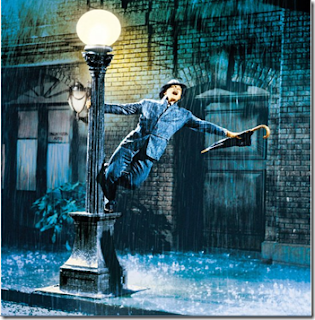 Over the winter I saw a live performance of Singin' In The Rain @ a local theatre with aspiring actors. The lamppost scene still gets a standing ovation – a tribute to Gene Kelly's tremendous talent in the 1952 film. 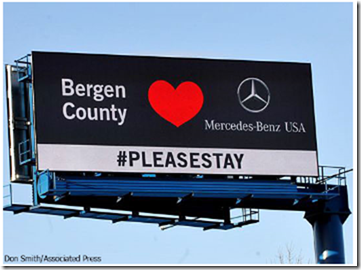 Shortly after the first of the year Mercedes-Benz announced that it would be moving its corporate headquarters from Montvale – Bergen County NJ to Atlanta – taking with it 1,000 well-paying jobs. The company has been in NJ for over 40 years. NJ, home to 14 of the world's 20 largest pharmaceutical companies, also learned the last few years that Merck would close its Summit, NJ facility in 2015 & close & move its 23 year old global headquarters intrastate from Whitehouse Station to an existing facility in Kenilworth, NJ. These moves help Merck realize greater cost savings & operational synergies (i.e., less people on the payroll). In 2009 Roche began shrinking its 127 acre campus in Nutley, NJ & started moving the operation to South San Francisco with a loss of almost 1,500 NJ jobs. In 2013 Roche completely closed the Nutley facility shedding another 1,000 jobs. Roche had been in Nutley for more than 80 years with a peak workforce of 10,000 employees. The above closings & moves were part of an exodus from NJ that includes Hertz, Bristol-Myers Squibb, & Ocean Spray with personnel reductions by Warner Chilcott & Sanofi-Aventis. 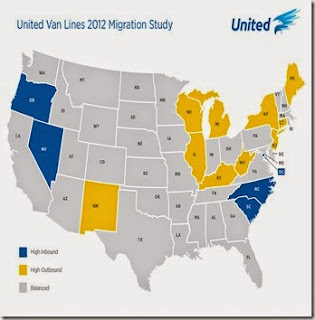 According to United Van Lines NJ led the nation for the second time in three years with a 62% (65% according to the 2014 Annual National Movers Study) out-bound rate meaning that almost twice as many people moved out of NJ than moved into the state. Washington DC led the nation for inbound movements for the last five consecutive years – do you think that is just a coincidence with the country's slide toward government dependence? Economics Professor Art Laffer moved his residence from California to Tennessee in recent years & the one way U-haul movements from California to Texas are well documented. See map below for details that show the tri-state area of NJ, NY, & CT hurting. Both NJ & NY each lost one congressional seat as a result of the 2010 census, the country's 23rd. Ten thousand millionaires moved out of NJ in 2014 – source Governor Chris Christie @ a town hall meeting in Somerville, NJ on March 10, 2104. Now the problem with NJ is that it is a highly regulated, highly taxed, high cost of living state (for instance – the cost of living in NJ is 32% higher than in Mississippi – source BEA) with lackluster economic growth caused by small businesses not starting or existing businesses not expanding because of the regulations & taxes – NJ has an overall rating of 48th out of 50 states according to the Mercatus Center of George Mason University, & is also rated 48th in regulatory, economic, & fiscal matters. To compensate for this NJ has the second highest median income (after Maryland – another federal government connection because of its location next to the nation's capital) of the 50 states meaning the highly paid scientists & professional people in the pharmaceutical & telecom industries have the incomes to enjoy the cultural & sports interests in the state & NYC & Philly metropolitan areas but NJ businesses have trouble competing worldwide after paying these salaries & non-professional people choose to move out as described above. For professional people who choose to stay NJ is a high cost but vital energetic state – for the rest, including the high paid who want less government intrusion in their lives, not so much so especially with NJ's higher unemployment rate compared to states it borders. But the question is where do New Jerseyans move in the U.S. to better their situation? The entire country is in the apathy to dependence stage of our history – government is now looked to as the supporter of families (in fact a decidedly second-rate crummy proxy for families) as it replaces the traditional two-parent family structure in far too many households while the aspiration of personal responsibility fades along with the liberty that has brought us the prosperity we have known since our founding that is now being spent down by people to make ends meet. 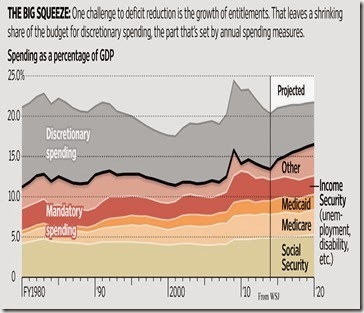 In the next five short years Social Security, Medicare, Medicaid, Income Security (e.g., unemployment compensation, disability benefits, food stamps, housing allowances), & other (e.g., interest on the national debt & ObamaCare) amount to over 75% of total federal spending thereby crowding out defense & every other program while overwhelming our ability to support all of these programs. This dependence is shown on the graph below prepared from OMB & CBO data. The 2015 Heritage Foundation Index of Economic Freedom rates five countries in the world as free & America is not one of them. America is listed as mostly free in the Heritage Index & comes in 12th in the 186 country analysis – America has dropped from sixth to twelfth - one place every year BO has been president. Small & medium-sized businesses are dying faster than they're being created - the U.S. also ranks twelfth among developed nations in business startups behind such countries as Hungary, Denmark, Finland, New Zealand, Sweden, Israel, & Italy. All net new jobs in America since the start of the Great Recession have gone to workers classified as foreign born (i.e., immigrants – legal & illegal). Statistically there are currently two unemployed people for every job opening not counting hundreds of thousands of people no longer looking for work because their search resulted in the conclusion that there is no work for them – this is indicative of the mismatch between needed skills & job openings – Senator Rob Portman of Ohio reports that three people have abandoned the workforce for every net job created since the start of the Great Recession. Inflation adjusted median household income is dropping & the Federal Reserve's official monetary policy's stated goal reduces the purchasing power of people living @ the median income level by $1,000 per year. Record numbers of people 25 to 34 (22.6 million such adults in 2013) have moved in with their parents during the past eight years & a record number of individuals renounced their citizenship or permanent resident status in 2014 – a 14% increase over 2013 which also was a record. Productivity - the inflation adjusted business output per hour worked - declined @ a 3.5% annual rate in the first quarter of 2014. Since 2005 productivity has declined by more than 8% relative to its long run trend meaning that business output is nearly $1,000 billion less today than what it would be had productivity continued to grow @ its average rate of 2.5% per year. Lagging productivity growth is an enormous problem because virtually all of the increase in Americans' standard of living comes from rising worker productivity. Almost two-thirds (65 percent) of children in 2014 lived in households that participated in at least one or more of the following government aid programs: Temporary Assistance for Needy Families (TANF); the Supplemental Nutrition Assistance Program – (SNAP, i.e., food stamps); the Special Supplemental Nutrition Program for Women, Infants, and Children (WIC); Medicaid; & the National School Lunch Program. The largest number of children who lived in households that received government aid participated in the National School Lunch Program (35.0 million), followed by Medicaid (26.4 million), SNAP (17.3 million), WIC (6.4 million), and TANF (2.3 million). This dependence is exacerbated by BO's plans to legalize every illegal immigrant he can find – simultaneous open borders & open welfare programs that total 126 such programs as counted by the Cato Institute form a suicide pact & giveaway of our way of life. The cost of ObamaCare is also baked into the cake as 11.4 million people according to BO's count have picked healthcare insurance policies through one or another of the ObamaCare insurance exchanges during the official sign up window that ended on February 15. America's Health Insurance Plans (AHIP), a national political advocacy and trade association with about 1,300 member companies that sell healthcare insurance coverage to more than 200 million Americans reports that 85% of the people who signed up for ObamaCare via the healthcare insurance exchanges are eligible for government subsidies which amount to 76% of the premiums. The 76% subsidy level is in line with government subsidies received by participants in Medicare Parts B & D.
You can try to minimize the impact of the cost of the American welfare system but you cannot totally eliminate it anywhere you move. 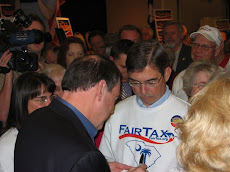 Scott Hodge, President of the Tax Foundation, calculated that the top two quintiles of income earners currently pay $1.5 trillion in taxes that go to the bottom three quintiles (yes, this means even an average middle quintile family – i.e., middle class - receives over $7,000 more in benefits than they pay in federal taxes each year) – this represents 21% of the top quintile's income. Mr. Hodge calculates that in order to bring every family in America to average would require the people in the top two quintiles to pay higher taxes than they currently do with people in the top quintile paying the vast majority of an additional $2.4 trillion per year in federal taxes or 74% of their income. For instance, someone making $400,000 per year working for Cantor-Fitzgerald or JP Morgan in NYC who takes a train from NJ to NYC every day & works long hours (on things that most people have no idea about) in addition to the time of the commute will be required to pay $300,000 to the federal government to support BO's income inequality programs. This leaves such an individual $100,000 to pay state income taxes, sales taxes, & property taxes before he starts to wonder why he is working all of these 60+ hour weeks. I know people in their 20s, with college degrees, who are about to go through the first quarter of their lifetime earning potential years with no American-dream future in sight & people in their 50s & 60s who realize they will never work again let alone for anything near their previous compensation. BO's promises in 2008 of the hope of bringing everyone up have turned into class warfare & envy that really were deliberate plans to bring everyone down to the same government dependent level whether they live in NJ or any other state. I ask everyone who reads this post who supported or still supports BO to look @ the above information with an open mind & for one minute bring yourself into the world of ideas to see what BO's policies have come to – to the misery, poverty, & wreckage of human lives – to see that the vast majority of human beings are only capable of being led – they don't have the capability to rise, they only shrink if there is a negative influence or excuse to fail. The sky is the limit with liberty & free enterprise. In order for America to return to the prosperity of her founding excellence we need a mindset change that dares great enough to trust our founding principles of limited government, self responsibility, & free enterprise – a mindset change that sees through & rejects every politician who tries to make us dependent on government while he or she only gets richer @ our expense. I offer four points for accomplishing this mindset change in the referenced post below. "We're going to count on the judges." – House Rules Committee Chairman Pete Sessions (R., TX) speaking after it became obvious that the Republican controlled Congress's legislative attempts had failed to tie the FY 2015 funding of the Department of Homeland Security (DHS) to BO's executive actions that removed the immediate threat of deportation for millions of illegal immigrants & provided other benefits to illegal immigrants like the issuance of work permits & Social Security cards, & providing cash in the form of tax refunds even for years when no income tax return had been filed. "The good news is that the president's executive action has been stopped, for now. This matter will continue to be litigated in the courts, where we have our best chance of winning the fight." 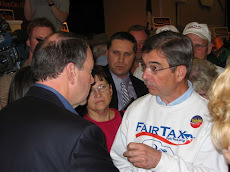 – The thought Speaker John Boehner conveyed to his caucus behind closed doors when he realized BO had won another round in the immigration fight described above. "The Senate has now done all it can do given their unique procedural constraints. It is clear that the legislation before us, while not exactly what the House wanted, is the only path forward to avoid a potentially devastating shutdown." - Idaho Congressman Mike Simpson speaking about the House vote extending DHS funding until September 30, 2015 without a measure to block BO's executive actions on immigration. "I think that our supporters, our constituents out there, they are disappointed that we talk tough rhetoric, that we are going to fight tooth & nail, & then we ultimately roll over @ the end of the day." – LA Congressman John Fleming talking to reporters about the DHS funding – immigration legislation that gave BO everything he wanted on the matter. In the middle of the afternoon this past Tuesday the House retreated from several previous positions regarding tying the FY 2015 funding for DHS with measures to block BO's executive actions regarding immigration & passed a clean DHS funding bill (i.e., without mention of BO's immigration executive actions). The House relented & concurred with a Senate Amendment to a previous House bill (HR 240) that extended the date of the funding for DHS until the end of the fiscal year & did not mention the immigration issue thereby notching another win for BO over the Republican controlled Congress who simply does not have the numbers to bring cloture in the Senate (six votes short) or cannot override BO's veto in either Chamber (45 votes short in the House & 13 votes short in the Senate). An analysis of the House Final Vote Results above & the Senate Vote Summary below shows that Republicans were faced with the choice of passing a clean DHS funding bill or shutting down DHS to some degree. BO & the hostile anti-American media would have made sure that eventuality would not have worked out for Republicans. No matter how tough Ted Cruz, Jeff Sessions, or Steve King talk Republicans simply do not have the votes to control the outcome they prefer in the Senate or to override any of BO's vetoes without the help of Democrats. For instance, last Wednesday the Senate's attempt to override BO's veto of the Keystone XL pipeline legislation fell five votes short of the 67 votes needed. As an aside - after all of BO's unconstitutional power grabs @ the expense of Congress BO added insult to injury by saying the legislation "conflicts with established executive branch procedures" as part of his reason for vetoing the bill. This from a man whose every move virtually conflicts with the procedures in the Constitution. In the the above House Final Vote Results Speaker John Boehner was one of the 75 Republican Yea votes & he needed virtually every Democrat vote to pass the bill he presented on the House floor – more than twice as many Republicans voted against the Speaker than voted with him. This is a losing hand for Republicans. The Senate Vote Summary is below & it also indicates a no win situation as described above (i.e., government shut down or capitulation). KY Senator Rand Paul did not vote which shows his dissatisfaction with the bill but that does not help America move forward because BO will win every one of these battles in the world of public opinion. Measure Title: A bill making appropriations for the Department of Homeland Security for the fiscal year ending September 30, 2015, and for other purposes. Now it is bad enough that BO has all the numbers stacked in his favor as mentioned above regarding cloture & veto proofing – the immediate two big ones. Next you have to add in that BO has proven untrustworthy & there is no indication that he would faithfully execute any agreement (i.e., bill) that Congress passes such as comprehensive immigration reform that starts with securing the borders (I don't even know what that means but I do know BO would interpret it & enforce it to the Democrat advantage without any concern with how secure anything was). We do know that BO would more than faithfully follow (he would dutifully follow) the provisions of any such bill to promote & provide welfare benefits, paths to citizenship & voting, or other destructive measures to the apathetic citizenry who has no grasp of the totalitarianism that is coming. It is only the capitalistic power of free enterprise that has allowed the country to continue this long – without this economic power we would have been overrun long ago. The Founders made clear that the citizenry is sovereign so how has all of this happened? Simple – people like the government programs that they are dependent upon. There are just too many government programs that more & more people like more & more every day. In fact even the comprehensive immigration issue has a 70% favorability rating (53% favorability rating among Republicans) that includes some form of conditional amnesty. Source Pew as reported by Jason Riley in the WSJ on March 4. For most of our history each branch of the federal government would protect their own functions specified in the Constitution but with the emergence of BO's ideology people like Harry Reid & Nancy Pelosi moved from protecting congressional authority to supporting an ideology that they had waited for all of their lives. Hamilton writes in The Federalist No. 78 "the legislature not only commands the purse, but prescribes the rules by which the duties & rights of every citizen are to be regulated." At the time of our founding there were few laws so when Congress exercised the power of the purse there were not millions of people complaining about one government program or another being taken from them – an entirely different world from today. Based on observing BO the past six years makes clear he is an imperial president with nearly all the power – executive actions with his pen & phone come easy with little chance of a successful challenge as described above regarding immigration. Congress originally had some power & function but the power of the purse has faded as more people preferred the benefits of government welfare programs instead of Congress showing financial responsibility & a check on the president's power. Just look @ the ease with which BO paints Republicans into corners & then plays golf without a care in the world holding high favorability ratings while Boehner sweats bullets saying "I need this job like I need a hole in the head." A good image of who is winning. The only exception is that both elected branches rely on & even run to the judicial branch to resolve disputes as if they were some impartial body of infinite wisdom the Founders intended to decide such matters – this newfound power of the judicial branch mostly works in tandem with the elected branches to make sure the electorate does not bear the full consequences of their votes thereby continuing the 21st century illusion of the sovereignty of the people - the vast majority of which are not really sovereign over anything & are only capable of being led to apply for the next government dependent program. All of the above is important & obvious to anyone paying the least bit of attention. But the biggest issue in all of this is somewhat hidden; to wit, the reliance on the courts by the Republican Congress to settle matters best handled by Republicans winning elections that give them majorities to effectively govern. It is bad enough that there are so many 5 to 4 Supreme Court decisions with the votes cast not along legal lines but rather along ideological lines 4 to 4 with one swing voter. Now assume that a Democrat wins the presidency in 2016 & holds the office for eight years. Scalia (79) & Kennedy (78) are not young men even now. Just think what would happen by decisions rendered by a 6 to 3 statist court where the Republicans have no chance of winning on any issue whatsoever. 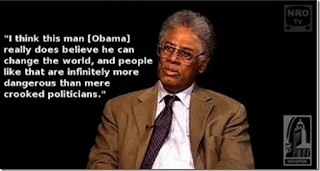 "From the very beginning BO has had an agenda designed to ingrain a permanent underclass of government dependent people on the citizens of the American republic. Until everyone, especially his political opponents such as congressional Republicans, start to clearly articulate an eloquent, effective, & persuasive understanding of this we are working @ a disadvantage." – from RTE post entitled BO's Plan To Ingrain A Permanent Underclass Can Be Overturned. With the above as a backdrop I was very encouraged to hear former NYC Mayor Rudy Giuliani take up this mantle of leadership last month by saying that he did not think BO "loves America." Rudy's thought was met with the usual politically correct condemnations such as Rudy could not know what is in BO's heart, that it was a divisive personal attack, & that there always will be ideological differences between people & that is all BO represents to America – BO is just another guy with a few different ideas. To learn more I decided to see exactly what Rudy had said & to whom he had said it. First Rudy said "I do not believe, & I know this is a horrible thing to say, but I do not believe that the president loves America." I wish Rudy would have said ". . . & I know this is a horrible thing to have to say. . ." – that is the horrible part for those of us who love America. 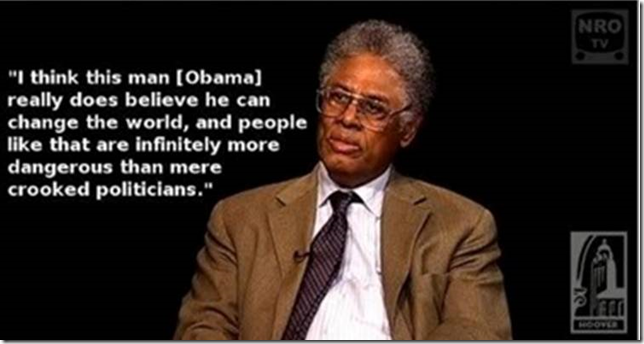 The fact that BO does not love America is the obvious part for even the least discerning among us. You do not need to know what is in BO's heart or be accused of making a divisive personal attack – all you have to do is look @ the offenses that BO has piled up against America the past six years to know he has anything but love for America. Next Rudy said "He doesn't love you. And he doesn't love me." The entire referenced speech was given to a private dinner group @ the 21 Club in NYC consisting of 60 Republican-leaning business executives & conservative journalists. Now who could possibly think BO loves these people? The only controversy with this remark is if it is taken out of context which it certainly has been by the hostile anti-American media who has presented the comment as if Rudy meant every American. Regardless of what is in BO's or anyone else's heart Rudy was on the right track – but just like Mitt was on the right track in September 2012 when he made the "47%" comment & then quickly backed away from it Rudy has done the same thing & so has many of his fellow Republicans. For instance LA Governor Bobby Jindal said "the president loves America, he loves our country – there is no doubt about that" but went on to say BO "obviously demonstrated for everyone that he is incapable of successfully executing his duties as our commander-in-chief" as if this is a more politically correct criticism. Even worse Florida Sen. Marco Rubio said he has "no doubt" that BO loves the country, "but I just think his policies are bad for our nation." What an understatement! Rudy started to back way from the comments himself including writing a WSJ milk toast half-in half-out op-ed explanation – as if an explanation is necessary @ all. But the worst was when Rudy tried to explain his remarks the very next day by saying "Well, first of all, I'm not questioning his patriotism. He's a patriot, I'm sure." Rudy's patriotism remark led me to look up the word "patriot" only to find out that the Merriam-Webster dictionary defines patriot as "one who loves his or her country and supports its authority & interests." RTE has made the case to expose BO's destructive plan to fundamentally change America beyond recognition ever since BO became a national figure based solely on the issues, without any personal attacks or other politically correct subtleties. I have asked everyone to join in with this effort so that all could see what we are in jeopardy of losing while we still have it. Rudy was on the right track before he was abandoned by fellow Republicans & then following suit he abandoned his own words & thoughts. The poison that is political correctness can not be seen more clearly than by the above example where one true statement or observation is made & then many supposed like minded people euphemistically explain the statement or observation away so as not to offend anyone @ any time thereby losing most if not all of the original message. The ultimate of this perversion is when human beings lose their instinct for self-preservation & desire of well being – America is just about there. Leonard Peikoff writes "The basic cause of totalitarianism is two ideas: men's rejection of reason in favor of faith, & of self-interest in favor of self-sacrifice. If this is society's philosophical consensus, it will not be long before an all powerful Leader rises up to direct the faith & sacrifice that everyone has been extolling. His subjects cannot resist his takeover, neither by exercising their faculty of thought nor their passion for values, because these are the two priceless possessions they have given up." Just as America will never defeat ISIS until we can use the words "Islamic fascists" to describe who we are fighting the Republicans will never win any issue against BO until they can clearly speak with one eloquent, effective, consistent, & persuasive voice to say, based on all the evidence ever since BO became a national figure, that in BO, the majority of the American electorate has elected the biggest enemy of America since King George III – twice.